Already download and install Windows 7 Pre-Beta build 6801? You probably have to leave the product key field blank during installation in order to complete the setup of Windows 7. 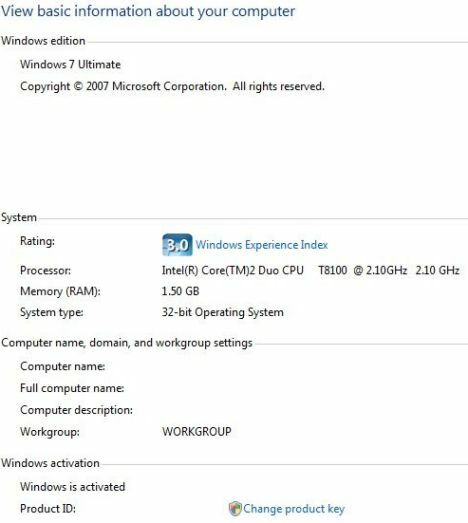 However, without proper activation, Windows 7, although it’s only an alpha release, can only be used for 30 days maximum (probably can use for up to 120 days as similar with activation free period of Vista with 3 rearms available – see how to rearm for more details). Please keep this e-mail for your records. Thank you for your interest in Microsoft Windows Vista RC1. Your Product Key is included at the bottom of this message. You may install RC1 on up to 10 PCs using the same Product Key. To help answer questions you may have related to installation and use, we have created newsgroups for Windows Vista RC1. To join or read postings in these newsgroups please visit http://windowshelp.microsoft.com. For the latest information on Windows Vista, please visit http://go.microsoft.com/fwlink/?LinkID=65938. Apparently, Microsoft said “please keep this e-mail for your records” for a reason. 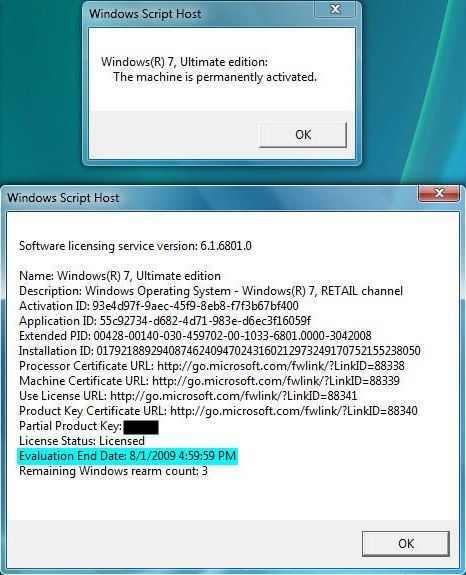 In fact, the product key for Windows Vista beta or RC edition can be used to activate Windows 7 Pre-Beta build 6.1.6801.0. To do so, simply go back to the very very old email archive to search for email from service@microsoft.com that titled with subject of “Microsoft Windows Vista Beta 2 Order Confirmation and Product Key”, “Microsoft Windows Vista RC1 Product Key” or other similar product key delivery email, and then get the product key in the email. The testing product key can be used to activate up to 10 PCs using the same product key. To activate Windows 7 online, just enter the product key in Control Panel -> System and Security – System Properties by clicking on Activate Windows now or Change product key link. However, do note that for Windows 7 pre-beta build version 6801, even after permanently activated, the operating system will still expire on August 1, 2009. For user who doesn’t have a Windows Vista Beta or Release Candidate product key, here’s a list of valid Windows 7 pre-release MAK product key for unlimited activation. Once activated (product key in entered and installed into the system), users gain ability to send feedback or bug report of Windows 7 beta to Microsoft through the built-in “Send feedback” program. If your feedback is valuable, who knows Microsoft may award you with a free copy of Windows 7 with genuine product key when it’s officially launched, just like Microsoft gave away Windows Vista Ultimate to its beta testers who provided feedback. If you didn’t manage to retrieve or find back the Windows Vista beta1 or RC1/RC2 keys, it’s also possible to rearm to extend activation grace period to 120 days, after which a new beta release should be released.